5,5 - 5,5..........Ajax vom Simbach. 5,5 - 5,5..........Carola vom Südharz. 4,4 - 4,4..........Alex von Kleinwaldheim. 4 - 4................Amsel von Hagenstolz. 3 - 3................Alf von Hagenfreund. 4 - 4................Addi von Hagenstolz. 3 - 3................Dina von Klockenhof. 2 - 2................Lump von Hagenstolz. “This black dog was imported from Germany into Holland by Mrs. Knijff-Dermout (Van Neêrlands Stam). He was a large and elegant male with a lot of substance and a magnificent head. 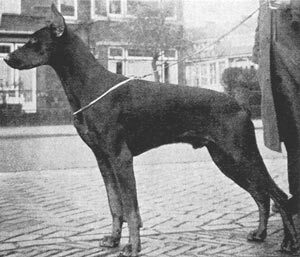 Unfortunately his tailset was too low and although he sired many excellent Dobermanns in Holland and Germany he passed on his poor tailset as well as his good qualities. For this reason Mrs. Knijff-Dermout sold him to another Dutch breeder Mrs. Bendien-Wansink. Mascha: SchH 3 and Bundessiegerin in 1965, DDR-Siegerin, Italian Siegerin, German Champion and International Champion. Mecki: SchH 3 and Bundessieger in 1965, Netherlands Champion in 1965, International Champion and best male at the World Show in Brünn. Vello: SchH 3, DV-DM participant and passed the Körung 'for life' with Körklasse 1 for character. Verry: SchH 3 and D.V. Leistungssieger in 1970. Palma: SchH 3, FH, D.V. Leistungssieger in 1975 and passed the Körung 'for life' with highest rating for hardness and working drives. Palma is dam of the von Ellendonk “X, Z, A, B” litters (Xandra, Xyla, Zamba, Zastra, Bingo). Toba: dam of the van de Kunnemaborgh “A, F, N, R, T, W” litters (Tanja).